In all of the years I have been in the home modification industry, the terms used for describing an accessible shower or shower pan have often been misused or misunderstood by the customers we talk to. I have come across words like ADA, Barrier Free, Accessible, Handicap, Disability, Low Entry, Walk In, Wheelchair, Senior, Roll-In, and Hospital used before the word Shower in an effort to describe a shower that is accessible. We get the idea of what people are talking about when they use these terms so in most cases me and my staff know how to assist customers. The one case that we have to clearly understand what they need is when we are asked for ADA showers. ADA is an acronym for The Americans with Disabilities Act which was created by the US government as a construction standard to address equal access into and navigate through buildings, for people of all abilities. However, ADA ONLY applies to commercial facilities where people with disabilities need equal access into the building, or elevators, or in my case bathrooms and showers. Buildings not being used by the general public are not required to follow ADA Standards. So private residences whether they are condominiums or single family dwellings do not need to use ADA compliant designs. Choices for ADA compliant products (like the one below) are extremely limited by the very nature of the guidelines and may not be the best fit for your personal residence. Non ADA designs are only limited by designers and end users imaginations. There are no accessibility restrictions and can be designed using your personal abilities as a guideline. 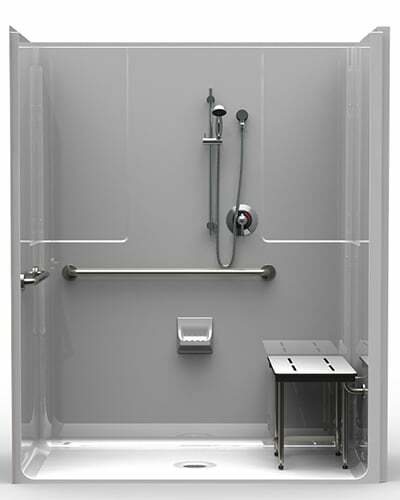 There are no shower size requirements, for example, so you can design the shower for your home to fit your needs and not a generic one size fits all that ADA tries to address. Making accessibility design decisions for your home can be as easy or as difficult as you want to make them. Are you creating an accessible home or space because you or someone else living there may have a moderate or severe disability? If so, designing your homes accessibility needs may only need to address what you need today. If you are like thousands if not millions of Baby Boomers that are designing their last home, then consideration for your abilities 10 years from now may drive your decisions. Whatever the case, there is tons of information and people that are experts in this industry that can guide you through this process. And it’s a growing industry that will continue to innovate and create new accessible products and designs. But the next time you ask someone for an accessible shower are you using the correct terminology? This entry was posted in Non ADA Products. Bookmark the permalink. 10 recommendations to create a safe, accessible home that will grow old with you.